Today I wanted to share a quick tutorial on how I used the Snowflake Shimmer Quilting Template in the on point squares for my Snowflake Shimmer quilt. The first thing I did was print out 2 copies of the template (3 were needed to take the photograph above; 2 are only needed to get the templates you will need). Double check your print settings and make sure you are printing “Actual Size”. For reference, I included the outer square and it should measure 7 1/2″ across and 7 1/2″ down. 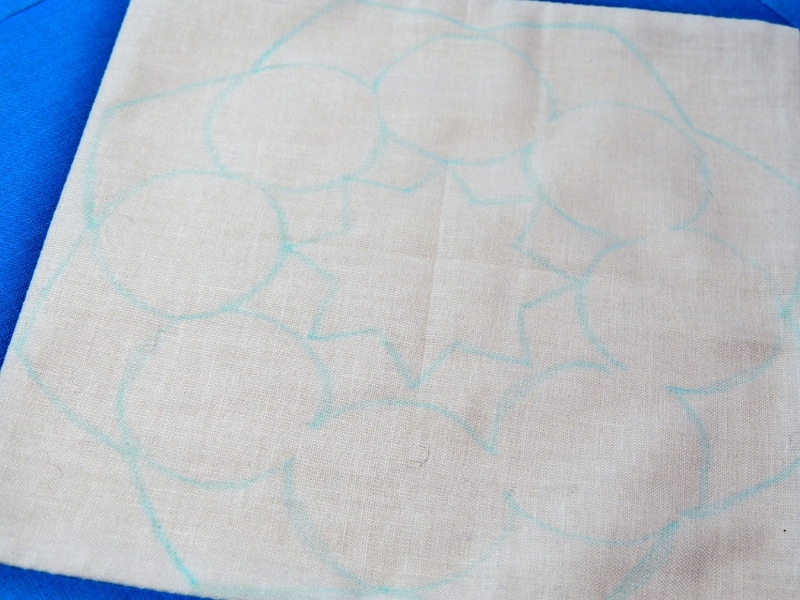 I then cut out the shapes that you can see on the right in the image above to use to mark the design on my quilt top. 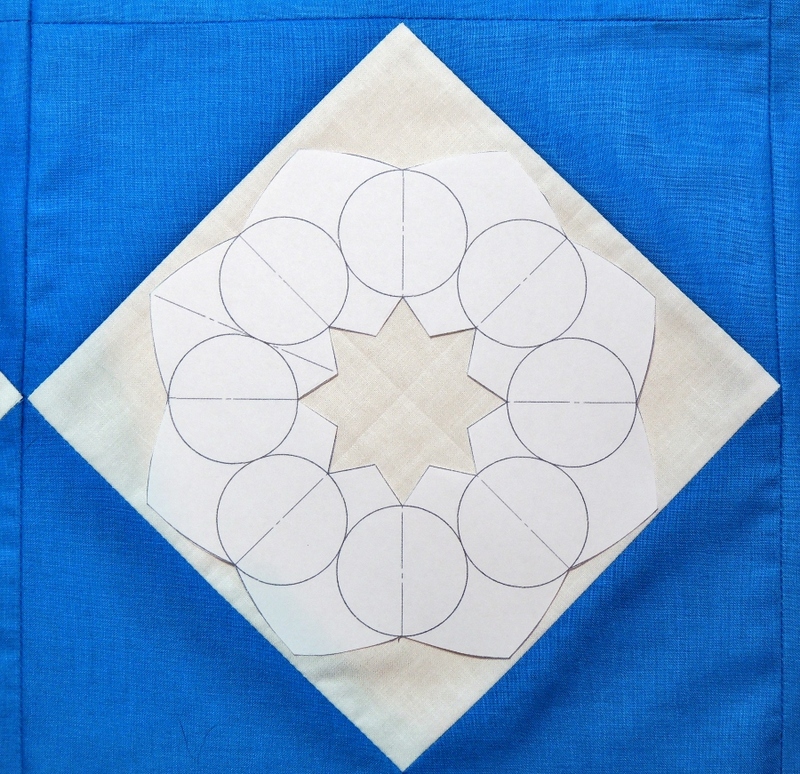 Align the larger template inside your on point square first and trace the inner and outer edges of the shape using a fabric marking device of your choice. Note to always check that the marking item you are using is compatible with your fabric! 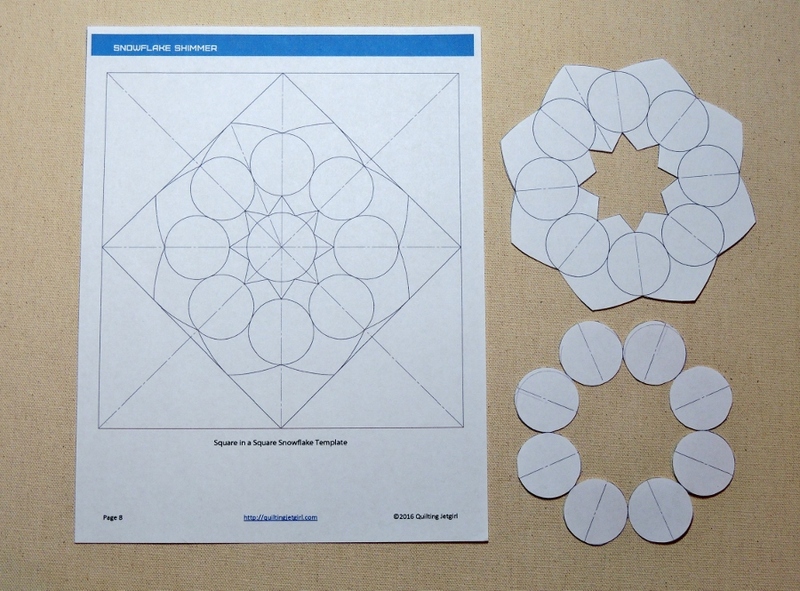 After tracing the first template, align the second template. The lines in the center of the circles are handy reference points for me, personally. Trace both sides of the second template. The next step is to admire your handiwork! Seriously, though, it is good to take a moment to make sure you can see all the lines and that you have not missed marking a section of either of the templates. 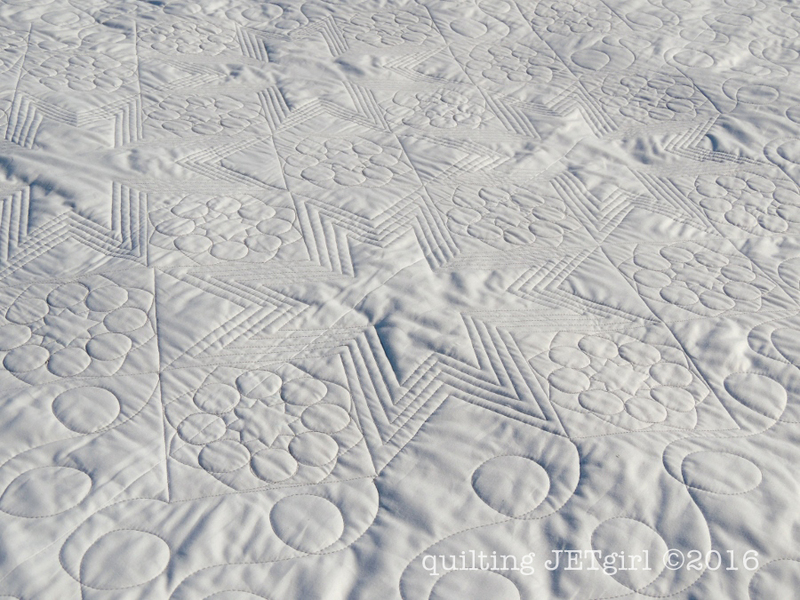 I chose to quilt the snowflakes on my domestic machine, and the video above shows how I quilted the snowflake shape following the traced template lines in one line of quilting. This template is only a suggestion, but I thought it would be fun to share with you! I look forward to seeing how you choose to finish your Snowflake Shimmer quilt! Wow, this is amazing, and what an innovative idea for drawing your design . Super video, and using the BSR on your Bernina by the look of it. OMG! This is a great video. So far I have only done straight line quilting. FMQ scares me. You make it look so easy. I may need to try a few FMQ practice squares in the future. Thanks for sharing. Great video. I like how you bury those thread tails right away. I am not so good at that! You make it look so easy and make me wish I could be so good! Love the template idea! Is that a stitch regulator in the video? Thanks for sharing how you mark with templates. It is a beautiful design. I love that you shared your video Yvonne. At first I thought you were using a walking foot, then I realized what that was. Super cute design! Such a treat to peek over your shoulder and watch you at work, Yvonne! What a delightful design–and such fun to see it created. 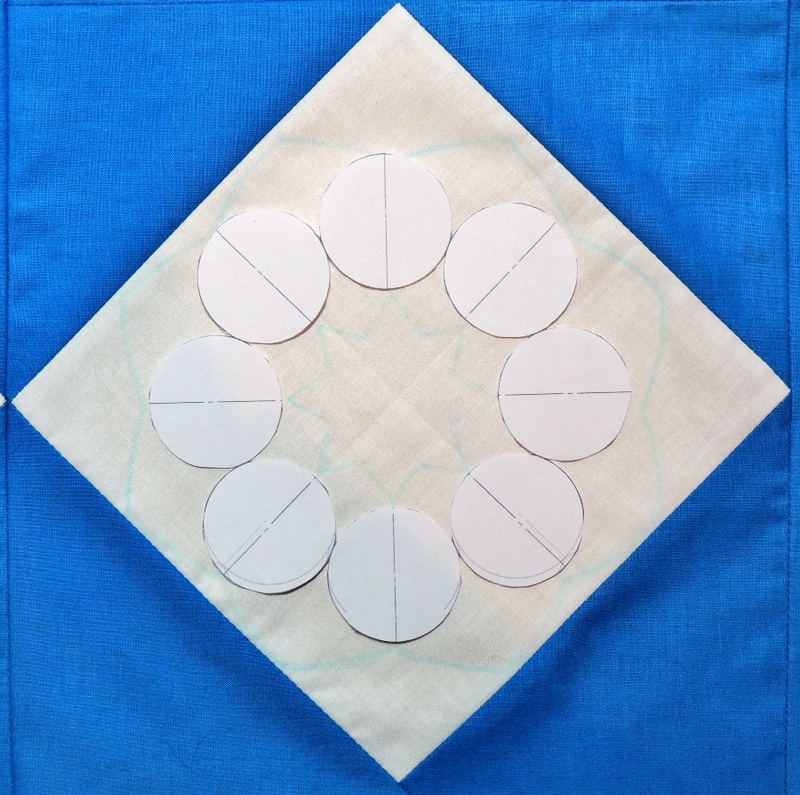 Excellent video with lots of information to be utilized in quilting projects. Thank you so much! Great video Yvonne! Thanks for sharing the template and your process! Second comment, I printed, outlined, and FMQ the design. Too dark to take a photo now, , as purple on purple not the best for a night photo, will do one tomorrow and post to you. Again, fab tutorial, and the video, that showed the path to take. Thanks again. That pattern is really visually interesting. What is that on your machine? A stitch regulator? Thanks for sharing the video. It was interesting to see how you quilted the pattern.